The CRP-10A48 is similar to the CRP10772, only the molding is slightly more delicate. 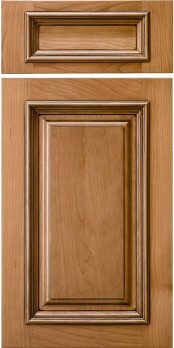 This door design also allows the client the ability to choose a framing bead, thereby enabling a variety of looks. The Ogee framing bead is a great choice for this door. “My cabinets look fantastic and everyone including cabinet installers (I have a union carpenter friend who’s been assisting) and the granite company that also sells cabinets have been impressed.” — Ian L.